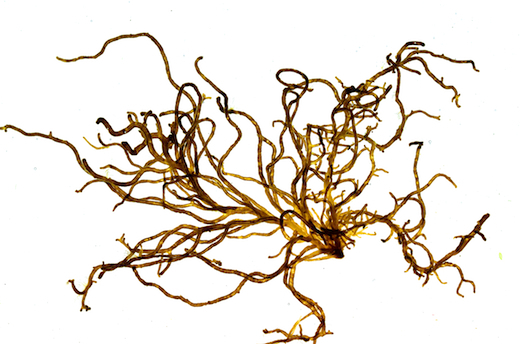 Thallus cylindrical, yellowish brown, to 500 mm long. Frond solid but soft, gelatinous, 1-4 mm wide with numerous irregular branches. Pseudoparenchymatous, easily squashed to reveal a multiaxial medulla of numerous colourless filaments and a cortex of stalked fan-like tufts of club-shaped pigmented assimilatory filaments 15-28 cells long. Assimilatory filaments grade into axial cells. Hairs present. Unilocular and plurilocular sporangia formed at the bases of assimilatory filaments. Site © M.D. Guiry 2000 - 2019. Important copyright notice: all text, design and photographs on this site are copyrighted by M.D. Guiry unless otherwise stated and all rights are strictly reserved. Click here for copyright information and contact. Website design: 249 Design Studio. Site maintained by M.D. Guiry (michael.guiry@nuigalway.ie). There have been 8736607 page loads since 1 January 2014 on 25 April 2019.